We celebrate the feast of St. Bridget of Sweden on July 23. (Her traditional feast day is on Oct. 8th.) She married around the age of 14 and had 8 children. (Including St. Catherine of Sweden). St. Bridget was a visionary and after her husband died she worked hard trying to restore the Church. She is the founder of the Brigettine nuns, and the patron saint of Sweden, Europe, and widows. 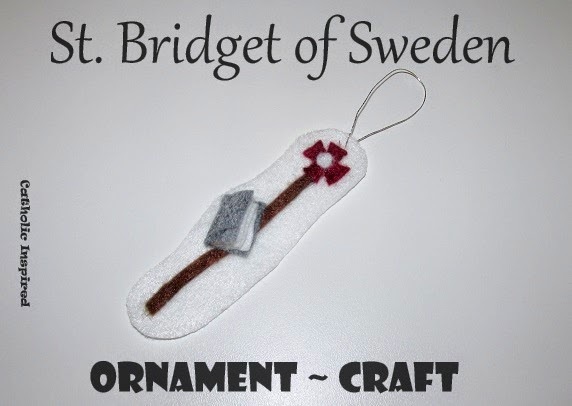 The symbols on the ornament which we created for her includes a "pilgrim's" staff, because she took MANY pilgrimages. The staff is accompanied by a book - another common symbol of her's. 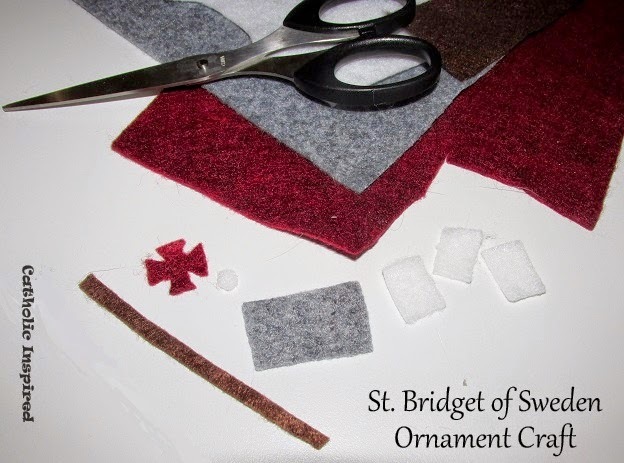 We used gray, dark brown, maroon, and white felt to create this ornament. We glued the staff onto a white oval for stability (we used hot glue). The book was created using a gray rectangle (the cover) and thee small white rectangles (the pages). It was all glued (hot glue) together at the book's "binding"; so it will partly open. Then the book was glued onto the oval with the staff. A silver threaded loop was added so it could be hung on our Liturgical tree. 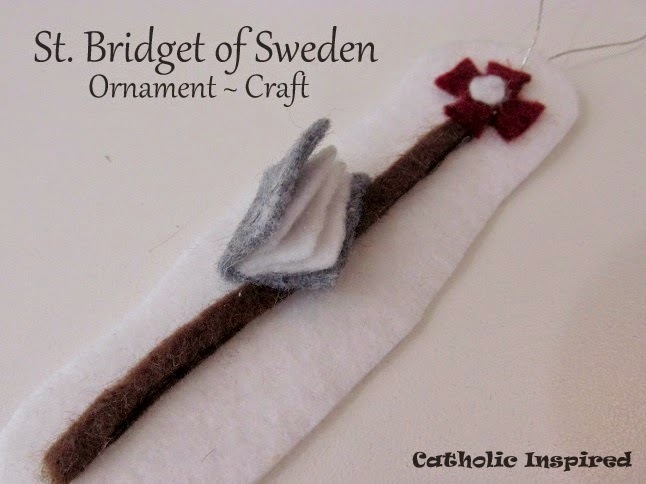 Note: St. Bridget of Sweden is also known as St. Brigit, St. Birgitta, or Birgitta of Vadstena. She is commonly confused with St. Bridget of Ireland, whose feast day is Feb 1.